• Look for & develop Technological interventions that are innovative. • mother television commercial targeting the masses across national geography and demographics. Very +ve, Feel good genre. • 3D Animation Series of 4 films to begin with for the digital and new media. Specifically targeted to youth. Light but edgy! • Over 10 Mln views across the 5 commercials in less than 2 weeks, only on FaceBook!!! • #ridesafeindia was trending on Twitter, on day 1. • Hundreds of thousands of Youth “Likes” “Shares” & “Comments” promoting the Cause of Road Safety by going viral. - Generating interest by not being preachy. 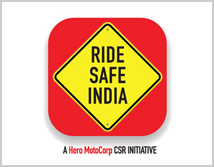 • HERO Safety Parks: HERO MotoCorp is adopting parks and within them creating Safety Education programmes. This includes creating familiarity of all Road Signs, Do’s & Don’ts on the Road and even sessions on promoting Safe Riding.